is the music composer/arranger for the United States Air Force Heritage of America Band stationed at Langley AFB in Hampton, VA. His compositions and arrangements have been performed by many educational institutions & world class organizations - including Troy University, the University of North Texas Concert Band, Greater Dallas Youth Orchestra Wind Symphony, the Orange County Independent Winds Ensemble, and many high school concert bands, marching bands, indoor winds, and drum and bugle corps across the United States. 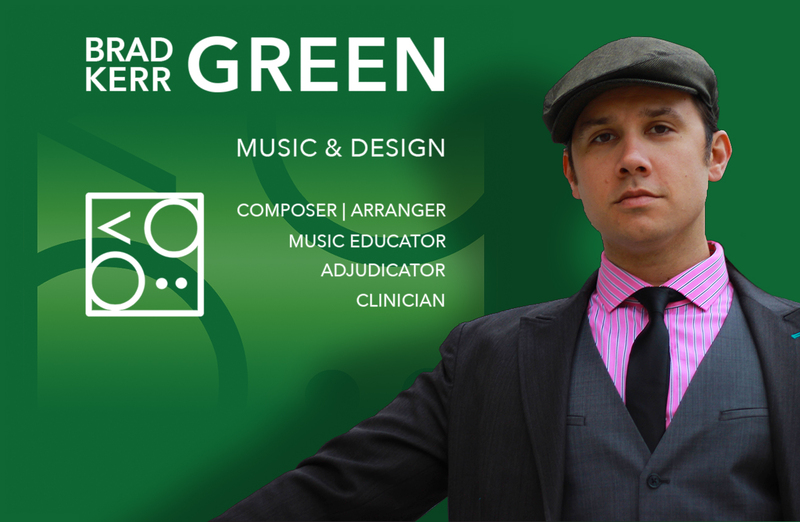 Mr. Green has designed high quality soundtracks for many competitive winter guard programs, including Flanagan World Guard, Pride of Cincinnati, and Braddock World Guard. Mr. Green was a performer, conductor, and supervisor for the Tony Award and Emmy Award winning production Blast! - Original London Cast, Broadway, First National Tour, and The Power of Blast in California. After his nearly 5-year period with Blast!, he worked with many world-class drum & bugle corps as a brass instructor/brass caption head, including the Blue Knights, the Santa Clara Vanguard, the Blue Stars, the Madison Scouts, and the Oregon Crusaders. Currently, he is the brass arranger and brass caption supervisor for the Pacific Crest drum and bugle corps. Brad completed his master's degree from Troy University (AL) and his BA with honors from The New School (NY).